About 5 years ago, when I worked in an office, we were situated across the street from a Save On Foods (for those outside of western Canada, they’re a grocery store chain). They had an ok deli. An ok deli with a stellar chicken pot pie. I’m not kidding. This was comfort food as good as it comes served piping hot. It wasn’t unusual to find at least one person in the building chowing down on a Save On chicken pot pie at lunch hour. It prompted a lot of discussions about what makes a good pot pie. And the resounding agreement was… salt. Yup. It’s like a more solid version of a hearty chicken noodle soup when you’re sick. It’s the hot, salty, chicken broth, or sauce in this case, that you want. That much salt isn’t terribly healthy but let’s face it, if you’re eating a pot pie you’re downing flaky pastry and a rich creamy sauce. It’s unlikely its health rating is high on your radar. 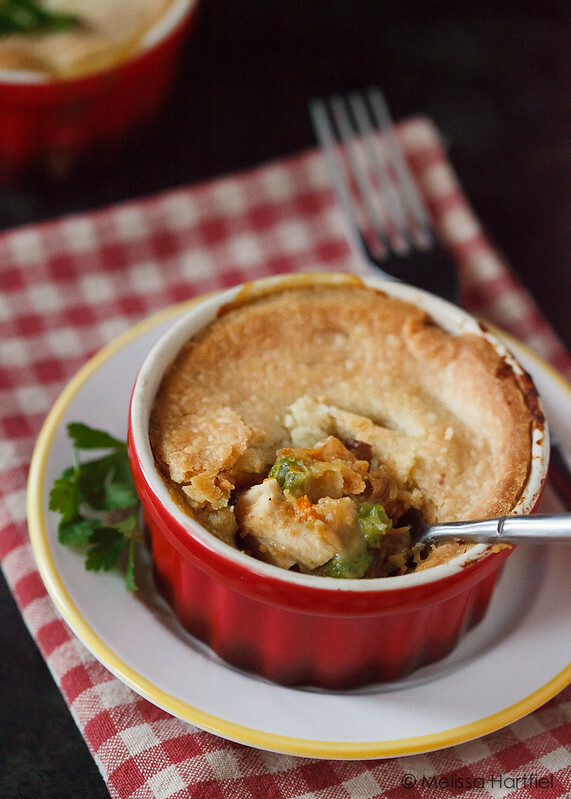 I have a great go to recipe for Chicken Pot Pie but for years, I made it with regular chicken stock. It was good but, it never managed to get that perfect salt, chicken flavour balance that the deli pot pie had, even when tinkering with the salt ratio. And then, a few years ago, by complete accident, I stumbled on the answer. Let me preface this by saying I very, very rarely use packaged mixes. I buy them the odd time and usually they wind up sitting in the cupboard until they expire and then they get thrown out. I would rather cook from scratch every time if I can. But… on this particular day I thought I had chicken stock in the pantry. Only I didn’t… and my roux for the sauce was well under way. Urrrrgggh! I searched the cupboard for a carton and the only thing I could find was a jar of Oxo Chicken in a Mug that I keep around for my dad. That flourescent yellow powder with green flecks in it… that’s the stuff. I needed something so I boiled some water and made two cups of it and used it. Perfect. Perfect salt and flavour ratio. I have also since discovered that it’s great for adding to the rice cooker when you want chicken flavoured rice. 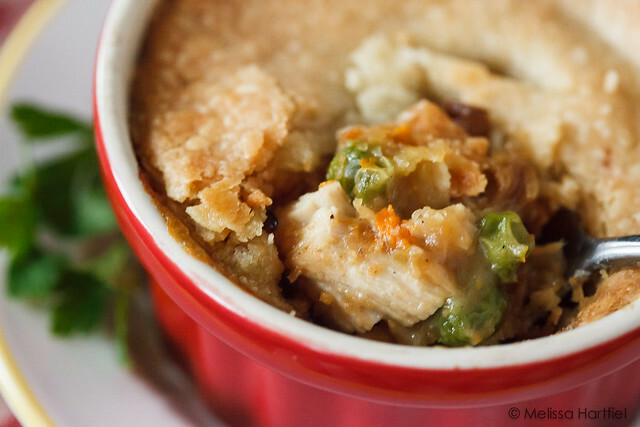 Turkey pot pie is a perfect way to get rid of extra turkey leftovers and it’s so versatile. You can absolutely make it with just turkey and the traditional peas and carrots and some cubed potato bits. But, after Christmas, I put almost the entire leftover dinner in the pie. This time around we made a mashup of wild rice and bread stuffing together (tremendously tasty by the way) and the leftovers went in the pie, as did the leftover roast parsnips, nugget potatoes and sweet potatoes. I threw in a cup of frozen peas as well. 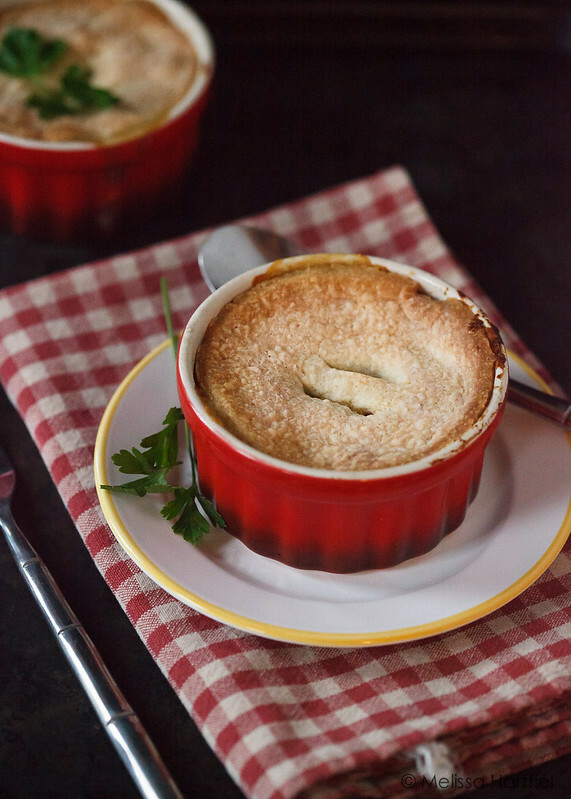 This recipe makes enough for a very deep pot pie in a casserole dish or a less deep pie with two individual pies as well. I only do pastry on the top because I don’t like my pies, dessert or savory, to be overwhelmed with pastry. I’m a filling kinda gal. The recipe is adapted from an old Betty Crocker recipe with instructions for both the chicken oxo method and regular chicken stock. Remove from heat. Slowly add in milk and broth, stirring constantly to keep the mixture smooth. Return to heat and bring to a boil, constantly stirring. Let it boil for 1 minute. Add turkey, peas, potatoes and your additional items, stir in and remove from heat. Roll out your pastry to match the shape of your dish. 2 nine inch pastry crusts will give you enough dough for a big casserole and two small individuals pies. Pour chicken mixture into greased casserole dish (and the smaller dishes as well if you are doing individual ones. Fit crust on top, cut out a few holes to allow steam to escape. Put them all in the oven. The small individual portions will be done in about 15-20 minutes. The large casserole will take about 35 minutes. But check regularly - once the pastry is golden and the filling is bubbling, they're done! You will need about 7 cups of filling items, including the turkey, to get the right filling to sauce ratio for this recipe. But feel free to use whatever you think will taste great in the pie. It's a great way to get rid of leftover veggies, potatoes etc. This post is not sponsored by Oxo in any shape or form. This is just what I use and it works! I don’t have any turkey leftovers. Hoping you had a wonderful Christmas Melissa and wishing you nothing but continue success both personally and professionally throughout 2014. I’ve taken a few cooking classes where the chefs have added salt to the dish in an amount that startled me. But then, upon tasting the dish it didn’t seem too salty..just restaurant style flavors. It makes sense that there are some homemade dishes that we simply undersalt and thus won’t be as good as the ones that we get when we eat out. Interesting tip about the powdered stock. Hope that the holidays were good to you! Yum! Great left over idea!